If we talk about Western and European values, which are constantly put forward as example for us, these are probably not the values the grandfathers of today’s Europeans espoused but something new and modernised, all-permissive, I would say. These are values that can be called post-Christian. They are radically and fundamentally at odds with the values handed down from generation to generation for centuries in our country, which we would like to cherish and hand down to our children and grandchildren. When during foreign policy battles we and many others face a demand to accept these new post-Christian Western values, including permissiveness and the universality of liberal approaches to the life of the individual, I think it is indecent on a human level, and from the point of view of professional foreign-policy experts, it is a colossal mistake and a completely unacceptable overestimation of your own influence on international relations. The Russian Federation’s choice is well known. We are not intending, of course, to export anything. We have had a practice of exporting revolution in our country’s history. We have ceased doing that, but a bad example is contagious. I repeat, the export of democracy and values continues to sow problems in international relations. It is precisely the export of values and the demand to accept only the European view of things that triggered the crisis in Ukraine. The export of democracy and values led to the so-called “Arab spring”, and we are now reaping the consequences. The “Arab spring” has, in turn, sparked the import of migration into Europe. So, export-import transactions, unfortunately, do occur and don’t benefit security one bit. Our choice is pragmatism based on the core interests of the Russian Federation. Those interests are simple. They remain unchanged and consist of ensuring that our country does well, that the well-being of our people improves, and that our economy and social sector develop steadily in an atmosphere of security and under the most favourable external circumstances possible. That’s what our work is aimed at. Here, there is no room for any idealised position or messianism. We are looking for overlapping interests with all who are ready to work toward a global economy that develops in the interests of all countries and peoples without exception. We are looking for common approaches with those who realise that there is no alternative to united efforts against terrorism and other modern threats, with those who are ready to work with us on an equal and mutually beneficial basis, taking into account mutual interests and striking a balance of interests. We adhere to these positions in our work at the UN, BRICS, the G20, the CIS, the SCO, the CSTO, the EAEU and other multilateral structures. And we adhere to the same positions in building relations with our partners and allies in various regions of the world, whether individual countries or interstate integration associations or other kinds of associations. We are ready to build relations with the United States, the European Union and NATO on the principles of equality, consideration of each other’s interests, mutual respect and, I repeat, without the import of values or attempts to impose any values on us, all the more so now that – as the latest information wars suggest – those values or pseudo-values have already been seriously discredited. Sergey Lavrov: Any diplomatic mission can share its experience of working in a particular country. Under Obama administration, we periodically received complaints about the US embassy in Moscow working in unbearable conditions: alleged surveillance, snubbing the Ambassador, him being turned down by all Russian agencies. We made a special effort to look into the situation. It turned out to be the opposite of what was claimed. We took stock of the contacts that the Russian Ambassador to the United States had at his request during the same period and we gathered corresponding information on the contacts of the US Ambassador to Russia with Russian official agencies. Russian ministries, agencies and members of parliament receive the US Ambassador dozens of times more often than Americans receive the Russian Ambassador. Regarding recruitment attempts, we have not made public complete statistics on this score, but over the past few years, especially during Barack Obama’s second term in office, such unfriendly moves with respect to our diplomats increased. In her recent TV appearance, Maria Zakharova mentioned a case when an attempt was made to recruit an officer from the Russian Consulate General who had come to the doctor to pick up prepaid medication for Yevgeny Primakov. It takes real professional gall, profound cynicism and unscrupulousness to make a recruitment attempt in such a situation. That was not the only case. April 2016 witnessed unprecedented recruitment approaches with an offer of collaboration at the level of the second in charge at the Embassy: minister-counselor. US special services, in a bid to make a recruitment offer, basically inserted $10,000 with an offer of collaboration into one of our senior-level diplomats’ car in his absence. If somebody is interested to know, the money was put on the balance sheet by our accounts office and is working for the benefit of the Russian state. There were also some really disgusting episodes when two staff members at the Russian military attaché’s office in Washington, who were having lunch with their wives at a restaurant near Washington on a day off, were seized by FBI agents, handcuffed and questioned, while being denied contact with the Embassy. In the end, we naturally extricated our comrades but there was not even an apology. As for the claims that on President Obama’s watch, the US Embassy in Moscow was subjected to “particular harassment”, I can see no grounds for such claims. There were a few episodes that came out into the open because the Americans tried to portray them as a hunt for US diplomats. In reality, nothing could be further from the truth. What happened was that intelligence operations by US representatives working under diplomatic cover were stopped. There was a well-known case when a US diplomat in disguise, a wig and fake eyebrows or something got into the US Embassy building, refused to present his ID to a security officer at the gate and hit him. There were also several other episodes involving US diplomats in disguise, including a man dressed as a woman, who then changed back into men’s clothing in a public toilet. All of that was recorded. Staff members of the military attaché’s office at the US Embassy very much like driving all around our motherland in rented cars. Therefore they do not have diplomatic number plates. They use Russian number plates. That way it is easier to avoid being spotted. They go to the Kaliningrad, Leningrad, Murmansk and Voronezh regions. They have been repeatedly spotted in Novorossiisk and the Chechen Republic and they have covered literally every inch of the border with Donbass. This is to say nothing about the fact that in addition to spying, US Embassy diplomats have been often observed participating in unsanctioned anti-government opposition rallies, including in disguise. You can make your own conclusions. First, we are realists, and we are certainly watching the incoming US administration’s preparations to assume office. I would not go to extremes in terms of expectations. The media and political analysts have made great many forecasts and speculations. Some are thrilled, while others say there is nothing to rejoice about and that nothing much will change. But there is no point talking about this now. Only after all seats are assigned and the new administration starts working will we see how relations between the United States and the rest of the world will develop. I said “the world” because Donald Trump has specific views. They differ greatly from the views of his predecessors, both Democrats and Republicans; his views are based on the fundamental US interests as Donald Trump sees them. When he says that his key foreign policy priority will be the fight against terrorism, we are happy to welcome this intention. This is exactly what our American partners lacked before him. In words, in various negotiation formats, they seemed to be cooperating with us and other countries, drafting relevant documents, but in fact, they were deceiving us when they pledged to separate the moderate opposition from Jabhat al-Nusra, which they did their best to protect from strikes. According to a recent leak about John Kerry’s meeting with Syrian opposition forces several years ago, the United States regarded ISIS as a suitable force for weakening Bashar al-Assad’s positions. What Donald Trump and his team are saying now shows that they have a different approach to this and that they will not apply double standards in the fight against terrorism in order to achieve unrelated goals. What Donald Trump has said about his resolve to focus on US security interests and on creating favourable conditions for American business is just what President Putin is guided by when setting out Russia’s foreign policy guidelines. I would like to mention one more issue which Donald Trump has spoken about several times. He said that each country must be responsible for its own development. We think so too. We believe that countries must act independently, that there must be less parasitism and more respect for the legitimate interests of all countries. Donald Trump has said that the fight against terrorism will be his main foreign policy priority, as far as I know, and so I hope that our cooperation on Syria and other counterterrorism issues will be more effective than our interaction with the Obama administration. But we will be able to officially coordinate possible ways of our cooperation in the fight against terrorism in Syria only after the President-elect, his secretary of state, the defence secretary and intelligence and security officials assume office. We believe it will be correct to invite representatives of the UN and the new US administration (as I said earlier at a meeting of the foreign ministers of Russia, Turkey and Iran in Moscow on December 20), to the planned January 23 meeting in Astana organised at the initiative of Russia, Turkey and Astana between the armed groups that signed a ceasefire agreement on December 29 and the Syrian Government. As you know, this agreement has been approved by the UN Security Council and Moscow, Ankara and Tehran have pledged to guarantee compliance with it. We hope the new US administration will be able to accept this invitation and will be represented at this meeting at any expert level it considers appropriate. This could be the first official contact during which we will be able to discuss a more effective way to fight terrorism in Syria. It should be remembered that Russia and the United States created and are co-chairing the International Syria Support Group (ISSG), which has not been dissolved. It has two task forces – a Humanitarian Task Force and a Ceasefire Task Force. There is a good chance we can invigorate these mechanisms, considering that the new US administration is resolved, according to its statements, to fight terrorism in earnest and not as this happened before. Sergey Lavrov: This is for the Syrians to decide. All UN decisions that were adopted by consensus in the past few years say clearly that only the Syrians themselves can decide the future of their country through an all-encompassing, that is, inclusive dialogue between all ethnic, religious and political groups of the state without exception. Under UN resolutions, external forces, including Russia, the United States and regional countries, should create conditions for launching such an inclusive all-Syrian dialogue. We have been working towards this goal for the past year. However, some opposition groups were unwilling to accept this, and the situation was influenced by some specific claims presented by the so-called High Negotiations Committee, which sabotaged the UN efforts to launch intra-Syrian talks because it claimed the right to represent all groups that stand in opposition to President al-Assad. I believe that one obstacle to the talks has been the fact that the UN only sent invitations to members of the political opposition, the overwhelming majority of whom were emigrants living in Europe, the Middle East or other countries but not in Syria, and to some opposition members in Syria. By the way, the Kurds are mostly part of the internal opposition, although some Kurdish politicians live abroad. Anyway, all Syrian groups that were invited to the UN-sponsored talks in accordance with related resolutions consisted of politicians, both emigrants and those who live in Syria. What these talks we lacking was involvement of those who really determine the situation on the ground, that is, armed groups or armed opposition, whatever you call them. I think we took a big and very important step forward after Russia and Turkey proposed involving the warring sides in the talks and the Syrian Government signed agreements to this effect with the field commanders of the majority of armed opposition groups. The goals at the Astana meeting include, first, the consolidation of the ceasefire regime, and second, an agreement on the field commanders’ full involvement in the political process, which includes drafting a constitution and holding a referendum and elections. This process was launched by the UN in Geneva but has lost momentum. There are now plans to re-launch it. We believe that field commanders must participate in this process as full members. I think that the process must not be limited to the groups that signed the ceasefire agreement on December 29. All other armed groups willing to join the ceasefire should have the opportunity to do so. We have received requests from a number of groups that are not parties to these agreements but are willing to join them. I consider this a healthy process that can help involve those who really control the situation [on the ground] in the talks. Question: 2016 will also be remembered because of the bloodshed in Nagorno-Karabakh – in Azerbaijan’s occupied territories. What will be Russia’s position if a counterterrorist operation begins in the occupied areas to cleanse Azerbaijan’s territory of the occupation forces and other criminal elements? Will Russia close the eyes to it? Will it interfere in Azerbaijan’s internal affairs? The bloody events that happened there in April 2016 are a matter of deep concern. At that time, Russia played a decisive role in stopping the bloodshed. Given their mutual recriminations, we negotiated with President of Azerbaijan Ilham Aliyev and President of Armenia Serzh Sargsyan in Vienna, and President Vladimir Putin held talks with them in St. Petersburg in June 2016, focusing on the need to create an investigative mechanism and increase the number of OSCE monitors directly along the line of contact. That it is necessary to investigate incidents was also discussed at the meeting of the presidents of Russia, Azerbaijan and Armenia in Astrakhan in 2010. Question: Two events have happened against the backdrop of repeated OSCE Minsk Group co-chairs’ condemnations of the use of force or the threat of force in Nagorno-Karabakh. One was a large clash on the Armenian-Azerbaijani state border – not in Karabakh – on December 29, 2016, which left several servicemen dead and wounded. The other was the arrest of a Russian-Israeli blogger, Alexander Lapshin, in Minsk some time later at the request of Azerbaijan over his visit to Nagorno-Karabakh following which he wrote that people in Nagorno-Karabakh had a right to decide their future themselves. When he went to Minsk on business, he was arrested at Azerbaijan’s request and has been in a Belarusian jail for over a month. Protest actions have been held at the Belarusian Embassy in Yerevan, but we don’t know anything about Russia’s reaction to the arrest of its citizen. Sergey Lavrov: First, we are against criminalisation of visits by journalists or private individuals to any territories in any country. Second, we are against extraditing Russian citizens detained outside Russia to any other country. There is one more thing I want to say on this. As you know, Russia and Belarus, as members of the Union State, have taken a principled decision to guarantee equal rights to their citizens in all spheres without exception. This includes efforts to coordinate a common visa space, which provides for a common migration space, a coordinated list of undesirable persons and a common extradition policy. We hope the issue is still on the table in light of the Belarus-EU agreement on the establishment of illegal migrant camps in Belarus. This raises questions and creates opportunities for the abuse of law, considering that there is no delineated land border between Russia and Belarus. We are about to start a dialogue on this issue with our Belarusian colleagues. In principle, we have long been negotiating a common migration policy. I believe recent developments call for accelerating these talks to finally reach practical results. As I said, we have consular access to the Russian citizen detained in Belarus, and we are working closely with officials from Israel, the country of his second citizenship. Question: Three years ago Russia signed an agreement on the Russian-Estonian border, but the State Duma of the Federal Assembly of the Russian Federation has still not ratified it. They say it is not the right time now. Sergey Lavrov: Yes, this is an interesting story indeed. In 2005, the then Estonian Foreign Minister Urmas Paet and I signed agreements on the land and lake borders. We had a clear arrangement that these agreements would be ratified without any incendiary addenda and any provisions containing territorial claims. We received a hundred percent guarantee that this would not happen and these agreements were submitted to the Estonian Parliament for ratification. A day before the end of the spring session, the Estonian MPs adopted a law on ratification, citing the Treaty of Tartu of 1920, which contains, as you know, territorial claims against the current Russian Federation. We asked our Estonian colleagues why, if they knew that they would not receive enough votes to ratify the agreements as we had agreed, they did not revoke the law and wait for the next session where it could undergo further discussions. They never responded, so we were forced to revoke our signature. Many years later, Urmas Paet, who still was holding the Foreign Minister office, and I agreed to sign these agreements again and launched the ratification procedure. We signed them in Moscow and agreed to exchange ratification instruments in Tallinn (by the way, this is the only capital of a former USSR republic that I have never visited as a Minister), but we also agreed that favourable conditions should be created for the ratification. By this we meant the absence of sudden demands towards each other, and refraining from constant accusations that Russia was threatening the security of Estonia and other countries in the region and the entire Eastern Europe. Unfortunately, when the agreement was submitted to the State Duma Committee on International Affairs and committee members held the hearings, Tallinn’s rhetoric became absolutely inappropriate for this process to continue without sparking discontent of the Russian public. Sergey Lavrov: Yes, this is indeed one of the matters I have long dealt with, above all because the Cyprus issue has traditionally been on the UN Security Council’s agenda, partly because UN peacekeeping forces are stationed on the island and the Security Council extends their mandate at regular intervals. The Security Council’s permanent members always co-authored the resolutions on extending the mandate or on the political settlement process in Cyprus. When I was coming to the end of my term as Permanent Representative to the UN in New York, the plan put forward by then UN Secretary-General Kofi Annan produced similar hopes as we see for the meeting in Geneva now. Annan proposed that the parties agree to hold a referendum, even with some key issues still unresolved. If the referendum went through, these outstanding issues would be settled with the UN that would establish an arbitration dividing territory between the two sides and settling ownership disputes. I met at that time with the Cypriot leaders when they came to New York. We took the strong view that it would be a mistake to have the serious issues dividing Turkish and Greek Cypriots settled through arbitration. But the Annan plan was supported and a referendum was held but failed to pass. If you are suggesting that my position at that moment was a reflection of my experience, yes, this is probably the case. The reason I say this is to get it across that attempts to put a positive face on everything are not always productive. I saw excessive optimism during preparations for the meeting in Geneva. I do not hide that we have spoken with our Cypriot, Greek and Turkish colleagues. We are in contact with everyone. Responding to their question on how we would like to see this conference organised, we said that if we are talking about an international event that will discuss guarantees, the best option would be to have the Security Council act as guarantor of a united Cyprus, and not just one, two or three countries. Our Greek and Cypriot colleagues agreed with this. In this respect, they expressed interest in having all five permanent UN Security Council members take part in this conference, which would examine international aspects of the settlement process. The other participants in the process did not want this format, it seems, and this leads me to suspect that some of our partners hope to avoid a solution in which Cyprus’ security would be guaranteed by the UN Security Council rather than one, two or three countries. I do not think this is the right approach, but we are ready to support any agreements that the two Cypriot communities reach together. Question: Donald Trump said in an interview the other day that he would be ready to consider an “end of sanctions for nuclear arms reduction” deal with Moscow. What can you tell us about this besides waiting until after Trump’s inauguration? Sergey Lavrov: You understand that I do not want to, and have no right to interpret anything Donald Trump may have said in an interview. However, I understand the phrase you mentioned differently from the majority of observers and commentators. If I understand correctly, he said he would see what can be done about the sanctions. This was one part of the phrase. The second said that if some good deals can be made with Russia, a solution should be found. The third part of the phrase said that he sees further steps in nuclear disarmament weapons as one of such good deals. I do not see a direct connection between nuclear disarmament and the lifting of sanctions. As for nuclear weapons, strategic stability and nuclear and strategic parity, this is a key issue in Russian-US relations. I can understand the US President-elect mentioning nuclear arsenals in connection with Russia. I am convinced that one of Russia’s priorities will be to resume the strategic stability dialogue with Washington, which has been disrupted by the Obama administration alongside countless other positive mechanisms. During its last week in office, the outgoing Obama administration proposed us resuming this dialogue. Being polite people, we did not reject the offer and have even had a meeting. But we will discuss this issue in earnest with the Trump administration. You must know that when we talk about international security and the steps that should be taken to reduce physical threats to this security, we must keep in mind absolutely all factors that influence strategic stability, and there are many factors besides nuclear weapons. They include strategic conventional weapons, including hypersonic weapons that can destroy targets in any part of the world within an hour even without nuclear warheads. Those who have these weapons do not need nuclear weapons. The second factor is the Ballistic Missile Defence (BMD) system, which is changing the strategic balance. We need to negotiate this issue, so that these changes in strategic balance will not destabilise the situation. One more thing that influences strategic stability is the space militarisation plans of the current and previous US administrations. There are also other variables, including the US refusal to ratify the Comprehensive Nuclear Test Ban Treaty (CTBT). All these factors – I may have forgotten to mention some – influence global strategic balance and parity. We are willing to hold talks as soon as the new US administration assumes office and prepares for such a meeting, which must be held in a business-like manner and with full awareness of our responsibility to our nations and to the rest of the world. Sergey Lavrov: As far as relations between Russia and Uzbekistan are concerned, they have long been those of strategic partnership and alliance, despite the fact that Uzbekistan withdrew from the Collective Security Treaty Organisation (CSTO) several years ago. Our bilateral allied relations are enshrines in international legal documents. We think that the new president and the new leadership of Uzbekistan are clearly willing to maintain continuity in our relations. We welcome this. We also expect that additional opportunities for stepping up Uzbekistan’s relations with the Russian Federation and its other neighbours, including multilateral organisations, will be used in the interests of the people of all of our countries. As far as the EAEU is concerned, it is making consistent progress. As you know, a new customs code was approved not long ago, which helps cut commodity registration time and costs and reduces the number of documents necessary to enable goods to cross the border. There is a functioning common market for pharmaceuticals and medical products. A single electric power market will be established before 2025. Despite the difficulties related to the current foreign economic situation and hard negotiations within the EAEU, I can see that this union has very good prospects. There are real results that the citizens of Russia and Uzbekistan can see and understand the advantages of EAEU membership. Other outside parties that are interested in the EAEU is another confirmation that this organisation enjoys good prospects. Talks are under way with approximately 15 foreign partners, both countries and organisations, on establishing one kind of relation or another. As you know, an FTA agreement has been signed with Vietnam and an intergovernmental trade and economic cooperation agreement is being discussed with China. FTA negotiations with Israel are at an early stage, with a so-called exploration group established. The same ideas are being discussed with Egypt, Iran, India, Serbia and Singapore. Of course, these processes should be regarded in the context of the broader plans and concepts that President Vladimir Putin laid out last year. These plans are about promoting the so-called Greater Eurasia project, where EAEU, SCO and ASEAN member-countries can participate based on different forms of cooperation. Incidentally, the secretariats of these three organisations met in Sochi in May 2016 on the sidelines of the Russia-ASEAN summit, which also confirmed the Southeast Asian countries’ interest in cooperation. On top of individual ASEAN countries desire to sign FTA agreements with the EAEU, ASEAN as an organisation is also considering the possibility. Cooperation aimed at aligning Eurasian economic integration with the Silk Road Economic Belt project is also part of these processes. In my opening remarks, I mentioned a kind of foreign policy mentality motivated by messianism and the wish to promote values as our European partners understand them. Accusations that Russia is seeking to “isolate” neighbouring countries from European values are voiced not only by individual journalists but also officials. Zbigniew Brzezinski has written Grand Chessboard. To me, certain modern politicians are still guided by his creed with regard to Eurasia. In his book on Eurasia, he said that barbarians should not be allowed to unite. That’s how he characterised us. Many modern politicians do not want the Eurasian economic integration project to succeed, though not with the same degree of rudeness and impudence. Let me cite the example of Serbia. It is conducting and is willing to conduct FTA talks with the EAEU, but the EU is sending it signals that characterise what I said. High Representative of the European Union for Foreign Affairs and Security Policy Federica Mogherini has an adviser, Nathalie Tocci, who said that Serbia’s relations with Russia were the main challenge for Serbia from the point of view of that country’s conformity to EU foreign policy. This was said in connection with Serbia’s current EU accession talks, rather than about Belgrade’s relations with the EAEU. This shows that nothing has changed during the last 12 or so years, when Brussels regarded any partner in Europe as being obliged to choose between Europe and Russia. To my profound regret, this vicious, shortsighted and counterproductive logic prevails to this day. As I said, the Eurasian Economic Commission sent a cooperation proposal to the European Commission. I hope that at some point the elementary politeness that has always been a European value will have some influence and that we will receive an answer. As for our message to the United States. We wish prosperity to the American people just like to any other nation. As I said today, we understand Mr. Trump if he wants to focus his work on this issue both within and outside the country. If what Mr. Trump and his team say about Russia and about their readiness to find common approaches to solve shared problems and overcome threats is true, if this is the position of the new administration, then we will reciprocate. Russian President Vladimir Putin has said that too on numerous occasions. Our position does not depend on who is a country’s leader; we are ready to cooperate with anyone who is committed to cooperation on the basis of equality and mutual respect of each other’s interests. Ahead of the election in Germany, much is being said about Russia’s hacker attacks. Can you prove that your country does not pose a cyberthreat? Question: We all remember how you congratulated your Chinese colleagues on the Chinese New Year during your news conference last year. You said then that Russia and China’s cooperation on the international stage is an important factor for guaranteeing security. The Chinese Foreign Ministry’s spokesperson said just recently that China seeks to continue strengthening and developing comprehensive strategic partnership between our countries in order to ensure security in the region and around the world. How do you assess cooperation with China on issues such as the Middle East, the Korean Peninsula and the fight against terrorism over the last year? What hopes do you have for future joint diplomatic efforts? A whole series of agreements were signed during President Vladimir Putin’s official visit to Beijing in June 2016. They included a joint declaration on economic and foreign policy cooperation, a joint declaration on strengthening global strategic stability, a joint declaration on cooperation in developing the information space (this covers information- and cybersecurity), and a declaration by the two foreign ministers on raising the role of international law. This list of agreements alone is evidence of the attention our leaders are giving to international issues. Of course, this includes the situation on the Korean Peninsula, where Russia and China are working very closely on the basis of trust to promote initiatives aimed at relaunching the negotiation process and at ensuring that the international community’s firm position on not recognising North Korea’s claims to nuclear power status and condemnation of provocative nuclear tests and missile launches does not become the starting point for an ongoing spiral of threats. We do not want this crisis to end up being used as a pretext for a rapid and out-of-proportion arms build-up and military exercises conducted in aggressive fashion. At the same time as we put pressure on Pyongyang, we also want to keep the door open for resuming talks. Russia and China have absolutely identical positions here and are working to convince the other participants in the six-party talks to take the same approach. As for Syria and your request to assess our achievements and losses, it is not our job to do this. We take the view that we acted correctly when we gave a positive response to the request for help from the legitimate Government of Syria, a UN member state, whose capital was only two-three weeks away from being seized by terrorists. I think the fact that we succeeded in pushing the terrorists back from Damascus and helped the Syrian army to liberate Aleppo is very important in order to preserve Syria as a multi-ethnic, multi-faith, secular state, as is called for by the UN Security Council resolution. Those who watched on in silence for 18 months as ISIS and other terrorists surrounded Aleppo are probably guilty of a crime, as they directly violated the UN Security Council resolution that called for Syria not to be turned into an Islamic state. An agreement was reached on joint economic operations on the Kuril Islands. The Japanese consider this an important achievement, but it will not be easy to implement. How can mutually beneficial conditions be created in this regard? Naturally, our position is based on the tangible results of the Russian-Japanese summit, that is, twelve intergovernmental agreements and about 70 business agreements. One of the most important ones was the agreement to establish a Russian-Japanese investment fund. We feel very positive about the visit; the goals were clearly set. It will not be easy to reach them, as President Vladimir Putin said at the news conference, given the complexity of the peace treaty issue. However, both parties are striving to solve these issues based on the vital interests of the Russian and Japanese people and not let other countries meddle in the process. There is much work ahead, but we are ready for it. Sergey Lavrov: Regarding the first question, we have discussed these arguments before and the relation between the events that took place and Ukraine’s obligations, including under the Budapest Memorandum’s terms. I remind you once again that the Budapest Memorandum contains just one single legal obligation binding Russia, the United States and Great Britain, namely, that force with the use of nuclear weapons would not be applied against Ukraine, which had given up its nuclear weapons. This was the only legal obligation cemented in the Budapest Memorandum in 1994. At the same time, of course, this document also contained political obligations declaring that we all desire and would respect Ukraine’s sovereignty, territorial integrity and independence. This accords completely with our position. The only thing absent from the Budapest Memorandum is an obligation on the part of Russia or anyone else to agree with the results of an anti-constitutional armed coup d’etat, led by people who made it their first act to proclaim a fight against the Russian language and Russians in Crimea. I am quoting the former leader of the Right Sector, Dmitry Yarosh, who said that, “Russians should be driven out of Crimea or exterminated.” No one had any obligation to accept political changes of this kind in Ukraine under leaders of this sort. When they violated the agreements of February 20, 2014 and failed to respect their obligation to form a government of national unity under guarantees from France, Poland and Germany, the Ukrainian coup leaders flagrantly violated the Budapest Memorandum’s terms regarding the need to respect in full Ukraine’s sovereignty and territorial integrity. As for the Minsk Agreements, I have no intention of rewriting them. They were unanimously endorsed by the UN Security Council resolution. I have heard nothing suggesting that France or Germany as countries taking part in the Normandy format, or Donetsk and Lugansk as participants in the Contact Group have proposed changing these agreements. On the contrary, the entire international community repeats ceaselessly that there is no alternative to the Minsk Agreements. It is true that high-level political and official circles in Ukraine have expressed the view that no one intends to implement these agreements and that they should be redrafted and that the United States should be involved too, in addition to the Normandy format. We have been hearing this for a long time, right since the agreements were concluded. US President Barack Obama’s administration has tried to support the agreements’ implementation. These efforts had their use but did not ultimately produce results. I have heard nothing about the Trump administration saying the Minsk Agreements should be buried and the crisis in eastern Ukraine resolved some other way. We have no reason to consider this possibility. Question: I have a question about the Balkans. Several days ago Belgrade was going to send a new train to the north of Kosovo. The train was painted in Serbia’s national colours and had a message reading “Kosovo is Serbia.” Kosovo special forces stopped the train at the border and forced it to turn back to Belgrade. President Hashim Thaci of Kosovo denounced the move as a provocation and as evidence of Serbia’s readiness to annex northern Kosovo using the Crimea scenario. After that, the Serbian President threatened to send troops to Kosovo to protect the Serbian population. A week ago, President of Republika Srpska Milorad Dodik said he was willing to withdraw from Bosnia and Herzegovina to join Serbia, after which they would take over Kosovo’s northern regions and then Montenegro. Can you comment on the current situation in the Balkans? Some experts say it is fast approaching war again. Sergey Lavrov: Unfortunately, the Balkans have been a source of serious conflict more than once. I am convinced, or at least hope that, although the only thing history teaches us is that history doesn’t teach us anything, everyone understands military confrontation must be prevented this time even despite escalating tensions. As I said in my opening remarks, these problems are largely created by the policy of those who are forcing a new, modernised and post-Christian edition of so-called European values on the Balkan nations. I have no doubt about this. As for statements by President of Republika Srpska Milorad Dodik, we stand for the implementation of the Dayton Accords, to which Mr Dodik pledged commitment until this day. At the same time, we often reminded our Western partners about the inappropriateness of keeping in Bosnia and Herzegovina, that is recognised as an independent state, the so-called Office of the High Representative for Bosnia and Herzegovina, a kind of governor-general who can force any decision on the three constituent ethnic groups – Bosniaks, Serbs and Croats. Several years ago, Bosnia and Herzegovina (BiH) even held non-permanent status at the UN Security Council. The EU continues to advocate keeping of this office, or it probably just cannot give up the powers it enjoys. This is irritating, just as the regular accusations of attempting to destroy the state constantly thrown at Serbian officials in Banja Luka. As I said, nobody is trying to destroy this state. President Dodik has reaffirmed his commitment to the Dayton Accords more than once. However, the Dayton Accords are being violated by those who try to take decisions in BiH without due regard for the opinion of the three constituent ethnic groups and without their agreement, contrary to the Dayton Accords. Hysterics over Bosnian Serbs’ decision to mark January 9 as their day of culture, which has been denounced as an attempt to undermine the Dayton Accords, is another provocation and evidence of pride wounded by the fact that somebody can cherish one’s own values more than Brussels’ post-Christian values. Question: My question is related to the situation in the Middle East. I spent a month in Iraq where I covered the battle of Mosul. I saw that harassment of Christians takes place both in Syria and Iraq. Christian monasteries are being destroyed; Christians flee their homes and are not going to return. I had an interview with Peshmerga General Sirwan Barzani, who said that people in this region will keep killing each other as long as there are corrupt politicians and no political will. He said the military understands that they will have to spill blood. He also said that after ISIS is defeated, a new ISIS would appear. 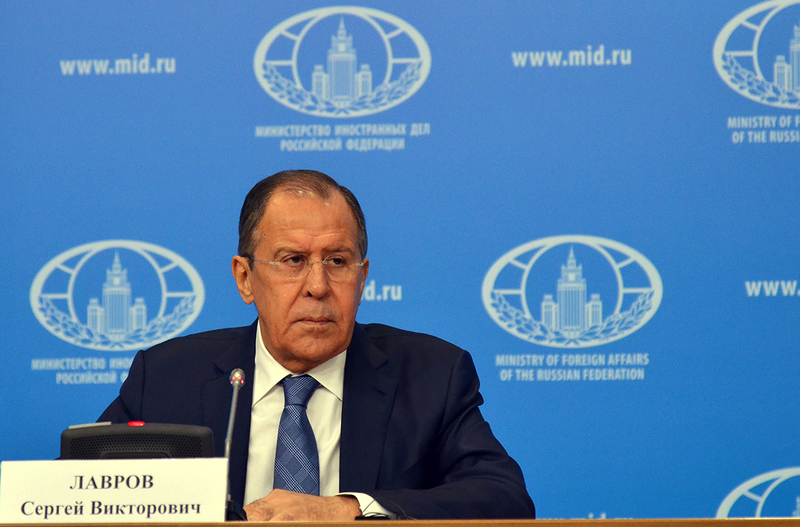 Sergey Lavrov: We are deeply concerned about the relocation of Christians. The number of them has dropped by 75 percent in Iraq and several-fold in Syria. In other parts of the region Christians also are having a hard time. We already spoke today about how this crisis appeared. This was again a result of exporting democracy and values. It is perplexing that these efforts came from Europe but did a lot of harm to Christians, among others. This again makes me believe that the current values exported from Europe are post-Christian. I suggest you look at the statistics. Only after the Russian Aerospace Forces began working in Syria last September at the request of Syrian President Bashar al-Assad, the US coalition, that had been there for about a year by that time, started to bomb ISIS positions and infrastructure, including oil fields which ISIS used for oil smuggling to ensure its funding. There are many examples proving that the Americans and their allies secretly wanted to use both Jabhat Fateh al-Sham and ISIS to weaken and eventually overthrow al-Assad’s regime. That is why they did not rush to implement their declared goal, that is, counterterrorism efforts. The second area we consider a priority is, of course, the mobilisation of global public opinion. We have held conferences on Christians’ rights at the UN Human Rights Council in Geneva three times. These conferences were initiated by Russia, the Vatican, Lebanon and Armenia. None of the EU member states joined us. Apparently, contemporary Europe considers defending Christians politically incorrect. You know that the article on the Christian roots of Europe was excluded from the founding documents of the EU, including the draft EU Constitution and then the Lisbon Treaty. We are planning another conference for this spring. It is only a conference, but I think the media will be able to use it to attract attention to the awful conditions of Christians and peoples of other beliefs in the Middle East. Apart from the UN, in the OSCE as well, we support the decision of the OSCE Ministerial Council on combating anti-Semitism. In 2015, we suggested that together with a declaration on combating anti-Semitism the relevant document on Islamophobia and Christianophobia be adopted. In such an organisation as the OSCE there is still no consensus on the adoption of documents against Islamophobia and Christianophobia, so there is a problem. We are aware of it and are trying to do everything we can to at least neutralise it, and then solve it. But I urge the European media to look at their own capitals and see how their governments treat Christians. I knew that this question would be asked. On the subject of lying, I brought here one quote. In a January 9 live show on the Voice of America Russian Service, reporter Danila Galperovich said that the claims by US intelligence officials who accused the Russian authorities of being involved in hacking attacks were not commented on by anybody in Russia from among those who usually make such comments by virtue of their office. Neither the Kremlin nor the Foreign Ministry nor the heads of committees in both houses of parliament purportedly made any statement regarding the accusations from Washington. This is the kind of truth that the Voice of America carries. In reality it lies. By the time Galperovich made his allegations, Presidential Press Secretary Dmitry Peskov, Foreign Ministry Spokeswoman Maria Zakharova and representatives of the Russian Federal Assembly’s foreign affairs committees had issued statements. All this hogwash – sorry for using a strong word – comes from a radio service that is funded by the US State Department. The aim of the Astana meeting is to involve not only the political opposition, which is still present (and we fully realise that) in talks, but also the field commanders. I will say more on interests versus moralising and messianism. I think that it is possible to solve many problems with many countries if we focus together on a pragmatic search for shared interests.